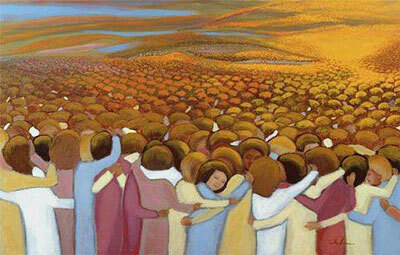 November 1 on the church calendar is All Saints’ Day. Many churches move this observance to the following Sunday so that all can gather to celebrate the saints throughout Christian history. And then, November 2 is All Souls’ Day, when we remember our relatives and friends who have died in the past year. So today, on this Sunday, we are observing both days. And this is also the day that we remind ourselves that we Christians are the saints on the earth here and now, remembering that the examples of those who have gone before us can strengthen our own journeys. Seeing with the eyes of the saints is like putting on saintly eyeglasses that reveal truths that we would not see otherwise. But we, who put on saintly glasses, can see that what the saints and our loved ones suffered here on earth before they died was not punishment, but instead, teaching and testing that made them strong. We can see that they now burn and shine as brightly and as indestructibly as gold. Not only that, but we can see with our own eyes that God is faithful, and that the righteous who have died in this life are even now abiding in God’s loving hands, and God’s grace and mercy are on them. Now I’m going to turn to the reading from Revelation. You all know by now that I find the book of Revelation downright astounding. It’s easy to read Revelation and figure that whoever wrote it must have been hallucinating—but actually, the writer is seeing with the eyes of a saint, seeing beyond what is, to what will be, being able to see and describe in graphic detail all things being made new. But that’s only the beginning of what these passages want us to be able to SEE for ourselves. In the gospel we get to the heart of what it means to put on saints’ glasses, in this poignant story about the raising of Lazarus. Jesus has shown up in Bethany and when Mary comes to where Jesus is and SEES him, she says, “Lord, if you had been here, my brother would not have died.” Mary has been able to SEE that Jesus is not just an ordinary man, but that he holds lifegiving power in his almighty hands. And then the writer goes on to say that when Jesus SEES Mary and everyone else weeping, he is greatly disturbed in spirit and deeply moved. Jesus didn’t have to put on glasses. He had 20/20 saintly vision, and this vision gave him the power not to turn away from Mary because he couldn’t take her pain, but instead to truly SEE, to gaze with the eyes of love into a person’s deepest suffering– and in truly SEEING that suffering, to then take it into himself. When Jesus asks where Lazarus has been buried, the people say to Jesus, “Come and SEE.” And now even Jesus weeps, not only because he has seen into the hearts of those around him who are suffering, but he also sees into every grave and every death, including his own. He SEES into the heart of the suffering world. Now Jesus SEES for himself where Lazarus is buried, a tomb in a cave with a stone rolled in front of it. And that’s what everyone else sees as well. They can no longer see Lazarus, but they know that his dead body, bound with a burial shroud, is in the tomb, and has already begun to decay. But Jesus can SEE through the stone, into the cave, through the death that is gripping Lazarus, to the lifegiving glory of God. And when Jesus calls Lazarus, and Lazarus comes out, the crowd can SEE for themselves, even without saintly vision, that Jesus does hold the life-giving power over death in his hands, and that only the Son of God could have such power. The fact that today’s gospel reading takes place at a tomb could not be more timely. We are constantly standing on the edges of and staring into the graves of people who are in those graves because those who killed them were blind to God’s love in this world. On Saturday, October 27th, eight men and three women, ranging in age from 54 to 97, died in the mass shooting at the Tree of Life Synagogue in Pittburgh, PA. The man who killed them did so because he could see only that they were Jewish. And not long before that, a black man and a black woman were gunned down at the grocery store, of all places, because the gunman could only see that they were black. And three years ago, Dylann Roof was welcomed into Mother Emanuel Church in Charleston, SC. After sitting through a Bible study with these people who welcomed him in, he was still so blind that he could not SEE the people who made him welcome. All he could see was the color of their skin. So he murdered them, right there in their church. Dylann was too blind to see that those around him were already dwelling in God’s hands. Even though he held the power of death in his own hands as he pulled the trigger over and over, he could not see that those he killed never left the life giving hands of God, even in death. We are surrounded by people who can see, but who are blind. We are living in danger of going blind ourselves, as we continue to turn a blind eye to violence that is constantly sending shock waves through the world. We are living in a time of hate, a time of disrespect, a time in which life is cheap in this country, and around the world, especially for those with dark skin, especially for those of different religions, for those with different beliefs—the man who recently mailed those pipe bombs all over the country mailed them to people with whom he disagreed politically. As people from Central America head to our border, we can see them heading this way, thanks to technology. But we have shut our eyes and refuse to look at what they are leaving behind. We choose to be blind about why they would leave their homes, taking a chance on finding something better for themselves and their little children. We are blind to their humanity, and blind to the fact that they are God’s children too, seeing only people who are not us getting ready to cross our border and break our laws, and who must be stopped and/or punished at all costs. We are running the risk in this country of becoming PERMANENTLY BLIND to what it means to love the least of these as God would have us do. We are risking becoming permanently blind to the suffering on this earth. The only cure for our potential permanent blindness is to put on the glasses of the saints, so that we can see directly into God’s glory. And that glory will blind us, but THAT blindness is what will at last give us the eyesight of the saints. With saintly sight, we can shine forth like the saints and break through the blindness that surrounds us and be light, not only in the life to come, but in our lives, here and now. With the eyesight of the saints, we can see at last how to be people of faith and to abide in God’s love. When we live through God’s grace and in God’s mercy, we can SEE God watching over us, and we can feel God’s hand holding us. With the eyesight of the saints, we can see beyond the color of people’s skins, we can see beyond their nationalities, we can see beyond their sexualities, we can see beyond their wealth or their power, and we see instead only God’s children, who are the neighbors that Jesus asks us to love as God loves each one of us. Because God has restored our sight. Thanks be to God, the King of Glory.